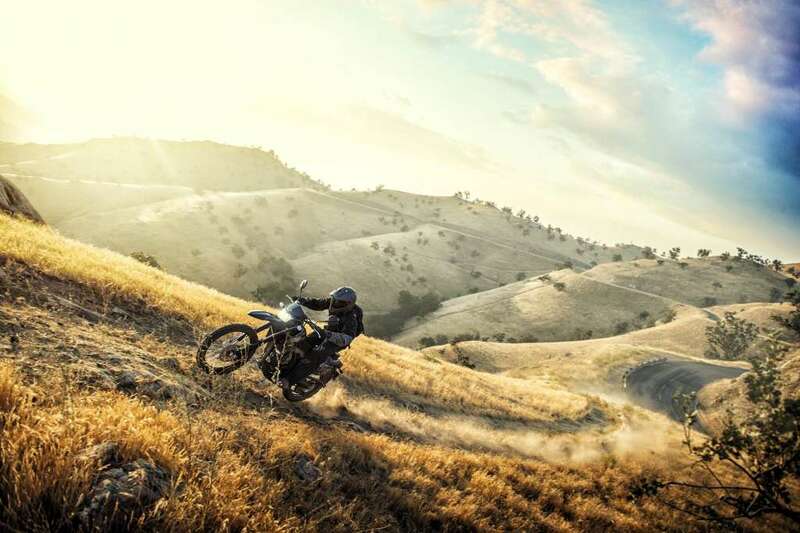 After a three-year hiatus, the KLX250 is back in the Kawasaki line-up and better than ever with the addition of fuel injection, new Uni-Trak® suspension linkage and other changes to increase performance both on paved and dirt roads. 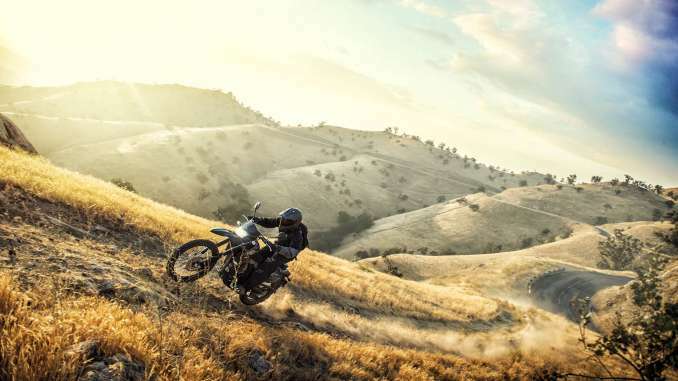 The KLX®250 motorcycle is built to take riders to new places. 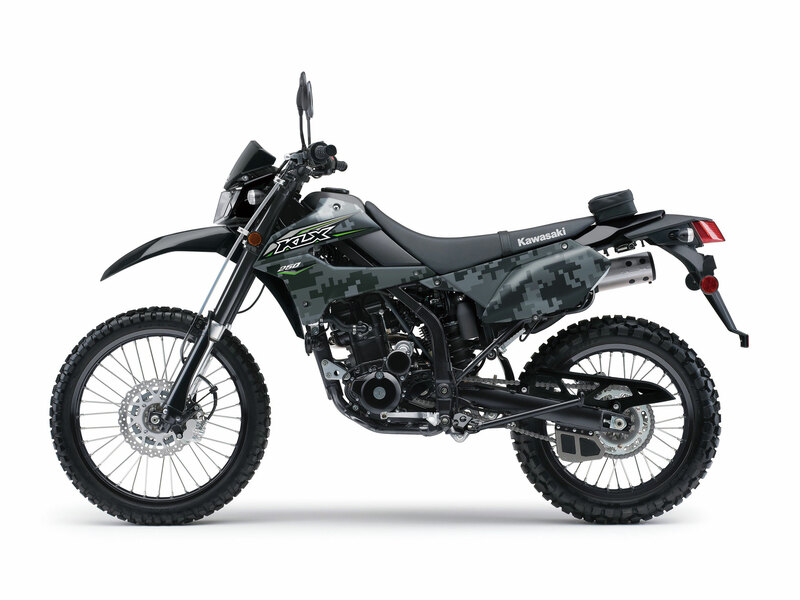 Borrowing notes from the KX™ line and Kawasaki’s racing heritage, this 2018 street legal, dual-purpose motorcycle is designed to cut through the busy traffic of an inner city or climb up a back trail to see the city from a beautiful view. The long awaited return of one of Kawasaki’s most versatile motorcycles, the 2018 KLX250. The 2018 KLX250 motorcycle receives a new fuel injection system for improved starting at all elevations, fuel efficiency and performance. 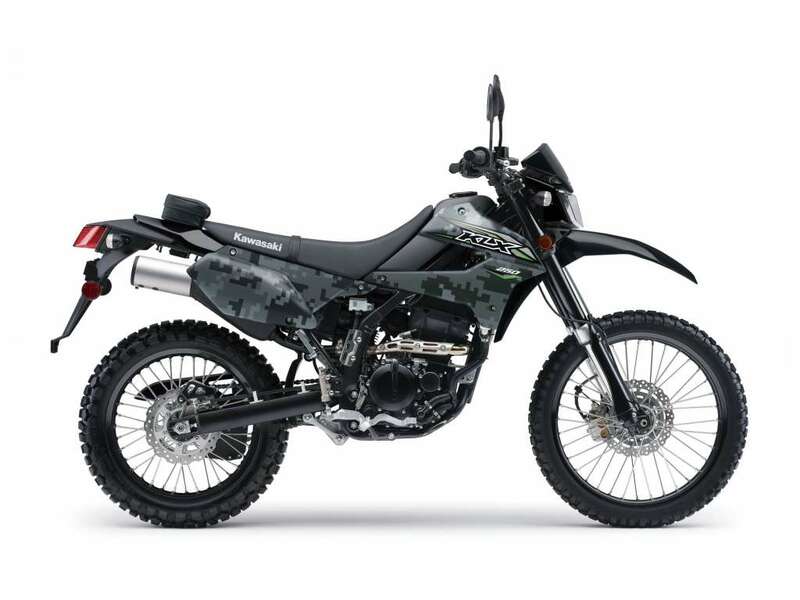 The KLX250 motorcycle is the ideal platform for riders seeking a less expensive, lightweight dual purpose motorcycle that is capable off-road. 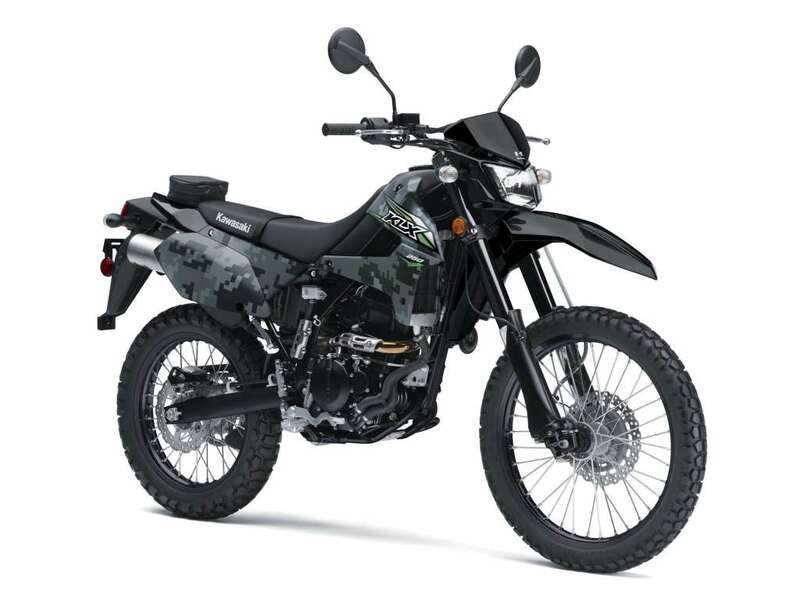 The KLX250 features aggressive styling that is sure to turn heads whether riding in the city or off the beaten path. Upon first glance you’ll notice the aggressive front cowl, front fender and two-bulb headlamp design. A sharp taillight further contributes to the aggressive styling. Taking cues from the KX family, the KLX250 motorcycle features two-piece radiator shrouds and KX-style fork guards, which help protect the inner tubes from rocks and brush. An all-digital instrument console gives the rider at-a-glance information. Features include a digital bar-graph tachometer, digital speedometer, clock and dual trip meters. Fuel-injection and low-fuel warning lamps are also included. Dual high-capacity Denso radiators like those used on KX motocross bikes deliver superior cooling efficiency and contribute to space and weight savings. The radiators are very slim and feature tightly packed cores and a fin design for excellent heat dispersion. •Catalyzer and secondary air system help reduce exhaust emissions so that the KLX®250 meets strict California Air Resources Board (CARB) regulations and can be sold in California. •High-capacity Denso radiators come from the KX™ line and deliver superior cooling efficiency. Their slim profile and tightly packed cores make the radiators smaller and lighter, while the special fin design provides excellent heat dispersion. •Flat top piston with pentroof combustion chamber delivers 11.0:1 compression ratio. •Lightweight piston, piston pin and connecting rod allow power-producing revs without excessive vibration. •Electric starter and the Kawasaki Automatic Compression Release (KACR)(KP), which automatically lifts an exhaust valve at cranking rpm, makes starting the KLX250 easy. •The incredibly hard coating in the aluminum cylinder bore means superior heat transfer with less weight. •It holds lubrication well, resists abrasion and seizure, and allows tight piston-to-cylinder clearances for more horsepower. •Digital ECU precisely controls timing, no matter how fast the RPM changes. •The frame is built up of box-section and tubular high-tensile steel. •The 26.5° steering head angle and 56.3 inch wheelbase contribute to quick handling. •The incredible frame rigidity contributes to excellent straight line ability. •Lightweight, highly-rigid aluminum D-section swingarm helps reduce unsprung weight. •Rear suspension linkage and damping settings provide a firm ride and a more planted feel in corners. •The nitrogen-filled, aluminum body, remote reservoir rear shock has 16-way compression and rebound damping adjustment and threaded spring pre-load. •Temperature compensating rebound damping keeps things under control even when the shock heats up under strenuous conditions. •Petal brake discs help reduce weight and the wave pattern helps to clean the brake pads for better brake performance. •Twin piston front caliper grasps a 250mm floating front disc for incredible stopping power. •Single piston rear caliper and a 240mm disc to give strong, reliable performance. •Tires designed for long life and grip on paved roads. •All-digital instrument panel features bar-graph tachometer, digital speedometer, clock and trip meters. •Narrow fuel tank contributes to the comfortable riding position and has a lockable, hinged one-touch cap. •U.S. Forest Service-approved spark arrester allows access to designated public riding areas and helps prevent wildfires.